Macadamia nuts grow on evergreen type trees and are native to the rainforests of Eastern Australia. We love them for their rich, buttery and big dose of healthy fatty acids. 80% of a macadamia nut is the valuable monounsaturated fat (the “good fat”), are a source of fiber and are cholesterol-free. Macadamia nuts are also one of the only plant foods that contain omega-7. It also is good source of vitamin E and thiamin (B-1). The first macadamia nut tree was brought to Hawaii in 1881, by William Purvis and many forays into experimental plantings followed – there was even an orchard planted in 1922 on 75 acres on Round Top Drive overlooking Honolulu, called Nutridge. Hawaii was at one time the largest grower of macadamia nuts in the world. Macadamia nuts very healthful for humans but beware, they are toxic to dogs, so keep them out of paws reach! In Hawaii, you can find macadamia nuts in all forms: raw in-shell, slow roasted in-shell, raw shelled, slow roasted shelled. We even have macadamia nut oils available! And butters too. – To shell a nut, the easiest way would be to acquire a nutcracker designed specifically (there are 3 on the market) for shelling the shiny (slippery), perfectly spherical (impossible to leverage against). There are other ways we’ve read or heard about, but they seem to involve cars, potholes, safety glasses, bench vise and hammers. Let us know if you know of an easy and safe way. – Eating raw is said to be more nutritious, as there are some phytonutrient thought to be sensitive to high heat. – Macadamia nuts are often just enjoyed as is. Pop in your mouth and savor that buttery, creamy texture. – Macadamia nuts are often chopped for topping yogurt, pancakes, cheese balls, ice cream sundaes. – They can also bring a rich meatiness to smoothies. – Lots of bakers add macnuts to cookies, brownies, granola, muffins, breads, pie crusts. – If you do end up shelling your macs, save the husks for your garden. They are said to make a good mulch. The nuts should be light in color. Darker ones may indicate age, as oils begin to turn rancid. Because of their very high fat content, macadamia nuts must be stored carefully to avoid rancidity. Refrigerate shelled nuts in an airtight container or bag for up to six months or freeze up to 9 months. 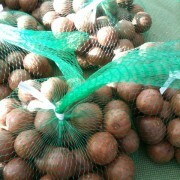 If macadamia nuts are already shelled, refrigerate in air tight container or bag and use within two months.